This June 18th, 2018, I was at Eferding to hold an art and science workshop for KulturKontakt Austria’s Artists in Residence Go to School program. 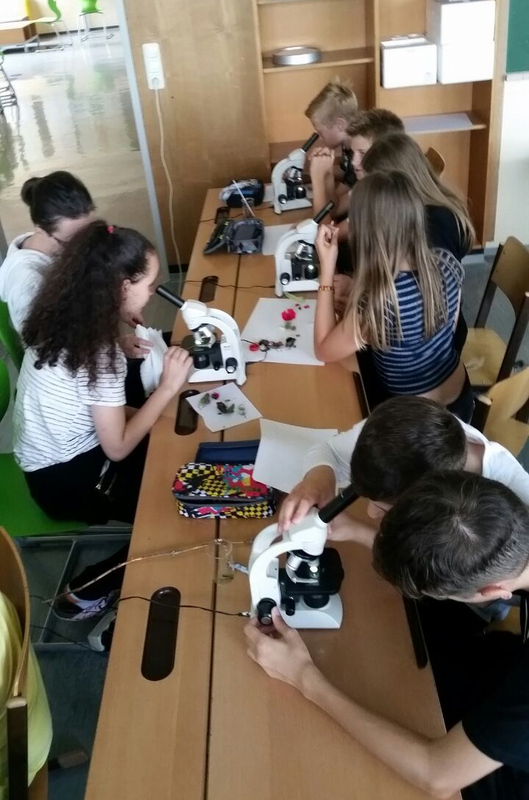 Thirteen-year-old students studied their specimens under microscopes, learned about Austria’s historic Novara expedition, did a scent workshop, and afterwards the girls and I discussed feminism. These are the kids who wrote the first cohort of Letters for Science, Wild Science’s participatory project where the public writes letters to people skeptical of the science of climate change, shape of the earth, vaccinations, etc. to create a respectful and empathetic discourse with people of different beliefs. Their letters were exhibited at our group exhibition at the Austrian Federal Chancellery in Vienna. It was really great to meet them for the first time. Thanks, kids, and to their English teacher, Frau Eva Heider-Stadler and KulturKontakt Austria for organizing and inviting me! Eferding is also the third oldest city of Austria and the place where astronomer Johannes Kepler got married, so it was really cool to visit!